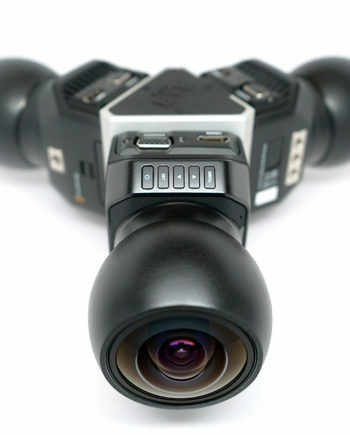 If you are looking for the most advanced virtual reality camera system in the world, and want to capture the most stunning virtual reality content on the planet, look no further than our 3-Axis Eye VR Camera. This complete package includes everything you need to capture stunning cinematic VR content at ridiculous resolutions. Included is the 3-Axis Eye Professional VR Camera Rig, 42 Blackmagic Micro Cinema Cameras, 42 Rokinon Lenses, a Sachtler Heavy Duty tripod, 4 hour system battery and charger, GPS timecode, 42 camera synchronization (genlock), wireless monitoring, wireless remote control, all wiring and accessories, professional flight cases (for everything), and for a limited time… includes $5,000 worth of Pro-Grade PNY SD cards, for 4 hours of continuous, uninterrupted recording. This highly sophisticated rig is available by special order and takes 3-6 weeks to manufacture, subject to availability. A high level of customization and modularity is possible, and we typically work closely with a client during the discovery and design phases of the project, to create the perfect camera for their needs. This is an extremely advanced camera rig, requiring significant resources and expertise to produce and post-produce. Thus far, we have built EYE™ VR cameras for two technologically capable Fortune 500 companies, and as of recently (May 2016) begun work on a new v2 version. This will improve on the original design in a range of areas. The original EYE™ camera was designed more than a year ago, and we have learned a lot in the time between, which we are putting into the new version of this camera. We will have a major announcement about the first commercial use of this camera in the latter half of 2016.